« Day 221 in Beijing: Bathrooms and Prayer Rooms. Day 222 in Beijing: First Class, Baby! We have just finished our 21 day vacation in Malaysia. It was everything we could have hoped for and more. Malaysia is gorgeous, people are friendly, and the weather is WARM! We flew AirAsia both ways and found out about a wonderful little extra from our friend, Kean, regarding an upgrade that not many people know about on their flights. There is a company called Optiontown. 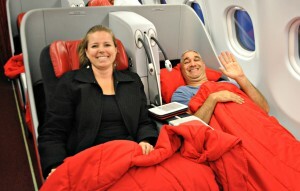 It works with many low costs airlines around the world and give a great deal. They give you a first class seat for about 75% off the advertised price if the first class or business class seats aren’t full 24 hours before take off. So, we decided to try them on the way back to Beijing and we were rewarded with lay flat seats, full meals, and complimentary bottles of water, for about $65 US each. We are talking about a 6 hour flight and going from economy to first class for $10 US per hour. That is unbelievable if you have ever flown in the US or europe from what I’ve experienced. Here are a few pictures from our flight. If you notice, we had to board the plane by walking on the tarmac, then climb up the stairs, and get into our seats. It was fun walking around with all the planes and automobiles flying by us. It reminded me of what flying back in the days must have been like. By the way, we also were given priority boarding so we were the first to sit down, in the front row, and the first to get off the plane. In Beijing, that makes a world of difference as the customs and immigration lines are usually huge and take an hour or more because so many people get off and need to pass through them. It took us about 20 minutes from plane to taxi this time. A huge improvement and we will continue to do use AirAsia and Optiontown for every flight that we can take from now on. By the way, a famous Chinese actress and singer, Tong Yao, was in our row. I asked her for a picture and she was nice enough to oblige. Here is a video of her in Singapore in 2010.